Every single December I have the exact same interaction with Brianne. I hand her an envelope with her name on it and tell her that I picked out something really special for her for Christmas. She hurriedly opens it and sees that it's a Nordstrom gift card. Then she pretends to cry, holds it to her chest like she's hugging it, and says "this is the best gift anyone has ever given me." I give her a knowing nod and then walk back to my office. A few years ago Matt was at family dinner with me at Bob and Cathie's house. All of my nieces and nephews were there so the place was a circus, as it commonly is on Sunday evenings. Matt and Emrie, my sassy niece with whom I have always had a very inconsistent relationship, hit it off relatively well from the beginning. This was probably because Matt is artistic and was perfectly happy to sit with Emrie and color while the other grownups did grownup things. Emrie was 5 at the time. The two were at the kids table, furiously working through a coloring book of Disney princesses, when we suddenly heard a very serious argument break out. Matt: You aren't coloring between the lines. Emrie: My mom said that it doesn't matter. Matt: Well, it does. You need to color between the lines or it won't look good. No. Stop. Go back to the beginning and read that conversation again. Because I promise that you read it in the wrong tone. Last month I was in Chicago. I told you about that already because I don't believe in keeping secrets from you. The weekend ended after several days of shenanigans with my childhood best friend Sam (shenanigans=gossiping about everything every person we went to high school with has ever posted on social media until 1:00 in the morning). And then it was time to go home. Skylar had met us in Chicago because Skylar isn't like you and me. He lives on airplanes and when someone is like "I'm going to fly to India" he's like "ok I'll just meet you there" like you said you are going to the backyard to sunbathe. I don't understand this part of him. I loath flying in airplanes with a hot and fiery passion. There is no person who is more angry in this world that Eli Whittlesconsin McCann waiting by the conveyor belt for a bag in the Boston airport after a red eye flight. Did that sound like a very specific example? INTENTIONAL. Because Skylar travels so much for work he has Holy Virgin Mary Celestial Kingdom Extraterrestrial Oprah Winfrey Status with Delta, which technically exempts him from all laws and allows him to use the U.S. military for any personal reason he wants. This means that Delta throws gold at him every time he even drives by an airport. And if twelve people aren't giving him a full body massage by the time he starts making his way down the jet-way, he has a random Delta employee waterboarded. So the other day I posted that thing about Strangerhood of the Traveling Snuggie and I thought that maybe you guys would all just think it was such a stupid idea that you would be ashamed to know me and you would delete my number from your phones. But instead eleventy hundred of you emailed me your addresses and social security numbers and names of your children's pediatricians, which was weird because I already have a pediatrician. First of all, it's very alarming how easy it is to get you people to send me your addresses on the internet. WE HARDLY KNOW EACH OTHER YOU COULD GET KIDNAPPED! Not that we know what kidnapping is! Second, I'm so happy that you all sent me your addresses because as it turns out you are all very evenly spread out across the country so I now have a place to stay in every state, which is going to be very convenient when I'm running from the law. I am so excited about this incredibly important thing we are doing. I'm trying to organize the list so that the Snuggie moves as efficiently across the world as possible (with some exceptions). There were handfuls of people living in the same town as each other so I'm trying to group those up together so that some of you can save the time and postage and just hand-deliver the Snuggie package. So the other day I was in the shower NOT THAT WE KNOW WHAT NAKED IS and the phrase "Strangerhood of the Traveling Snuggie" came to my mind and I was like "why is that not a thing yet? Then I realized that I don't know what that thing would be because I've never seen or read the Traveling Pants(?) series(?). I don't know the story or the concept but I think it has something to do with an item of clothing that gets passed around between friends and this makes the people feel closer and then we find out that Snape loved Harry Potter's mom all along or something. By the time I got out of the shower I decided that we should probably do this exact thing. 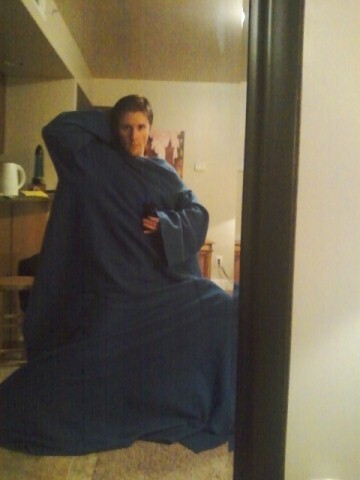 So I'm going to formally launch Strangerhood of the Traveling Snuggie. Eli: What are you doing tomorrow morning? Skylar: I have a meeting that I'm leading. Eli: That sounds like a rap lyric. Skylar: Are you the new Eminem? As you know, this is The Year of Creativity for me. You can tell because of all of my artistic face tattoos. It's been a really good focus for me for 2017. I've immersed myself in more writing and Strangervilling and that has been incredibly therapeutic. Strangerville Live, which we launched at the beginning of the year as a part of my Year of Creativity has been one of the most fun projects I've ever had. And all of it so far has led up to my niece telling me that my hair is "a little out of hand." Seriously. If you haven't listened yet, you need to check out The World of Babysitting. These stories are giving me life right now. The last few weeks of work have been like a roller coaster for me. A really long, unfortunately-bumpy roller coaster that often happens until about 2:00 in the morning. But without the fun parts. So I decided that I needed to take on a new creative hobby because my life philosophy is why be exceptional at a few things when you can be pretty bad at a lot of things? I have a special treat for you today for a lot of reasons. So a few months ago I wrote that thing about how I was watching Ollie and Duncan and they both ran into the dorms at the college by my house and the door locked behind them. Then you guys were all like "I'VE HAD THE WORST EXPERIENCES BABYSITTING CHILDREN" so I decided we needed to have a Strangerville episode about it. This episode includes contributions from Amy Rose AND The Suzzzzzzzzzz. My niece, Emrie, also showed up for what might be the funniest conversation I have ever witnessed in my life. You guys. I'm not kidding. I actually thought I was going to hurt myself during this interview. Even Meg, who never ever laughs no matter what ever, was leaning against a wall, with tears of joy coming out of her eyes. Meg's daughter, Ivy, makes an amazing appearance. I have a work thing out of town tomorrow so I dropped Duncan off at Matt's house this afternoon. Ollie was taking his 9-hour nap on Matt's bed so he didn't bother to come to the door to greet us. Duncan searched the house for about 20 seconds before finding him, taking a flying leap onto the bed, and landing right on Ollie's head. You guys. I think Ollie Pants may be the Zodiac Killer based on the psychotic response that I saw come from him. I have learned to never wake the Pantses up from naps. My niece, Emrie, in the studio for Strangerville. We know Duncan was born sometime around the beginning of November, but we don't know the exact date. I explained to him recently that his biological mother didn't keep detailed records (she was a big ol' mess and I don't think she actually knows who the father is). Duncan took it surprisingly well, probably mostly because I told him on Halloween right before trick-or-treating started so he was distracted at the moment. I adopted my baby at the end of January and at the time a lady who smelled like dog poop and who handed him over to me said that they thought he was about 12 weeks old based on his teeth or his eyes or the number of rings around his core or something. Then she took all of my money and forgot to tell me that I wasn't going to get a full night of sleep for the next four months. I pulled out my calculator and did very complicated math to determine that Mr. Doodle entered the world in early November. Sometime after that I decided we would just celebrate his birthday on 11/11 because it's memorable and it will look cool if we ever decide to tattoo it onto his clavicle. We texted Adam the other day to make sure Teddy and Renley had it in their calendars. Adam responded that he saw them putting it into their phones. So the other day I posted that thing about how I ain't much for book learnin' and I told you how I'm trying to read now so I don't get executed for failing to know how many characters in Of Mice and Men are mice. And then you guys left eleventy million comments about all of the books I should be ashamed of myself for having not read. And this level of response really surprised me. Because I had previously assumed 97% of you were illiterate. Anyway, the comments section of Stranger turned into a full-blown cyber attack on the public education system, which was new for me because it's usually an attack on how tight my clothes are or how I'm not supposed to offer to slap your children at the grocery store. I haven't referenced that in a while. Were any of you around when that happened? I made a joke about how I'm totally willing to help slap people's children in the grocery store if they're acting like brats and then every single mom on the entire internet emailed me and was like "I'M REPORTING YOU TO THE BETTER BUSINESS BUREAU" and then I had to respond to every single one of them with badly-photoshopped pictures of me petting kittens so the internet moms would know I was actually gentle and nominate me for employee of the week at Shakey's instead.